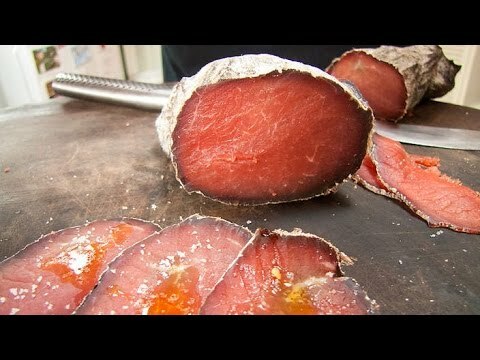 Bresaola is air-dried, salted beef that has been aged for up to three months until it becomes hard and turns dark red. You'll need a bucket and 3 metres of muslin cloth for this recipe. Cut the beef into long strips of about 8â€“10 cm, to form a long rectangular shape. In a metal bowl, combine the juniper berries, bay leaves, garlic, thyme, rosemary and olive oil. Place the beef into the bowl and rub the mixture all over. Place the beef and remaining mixture in a bucket. Cover with red wine and place a plate over the top to submerge the beef completely. (The oil will float to the top and act as a seal.) Refrigerate for 2 weeks. Unwrap the bresaola and thinly slice. Serve with good-quality olive oil.